Please scroll down after this post to see my JUGS post! 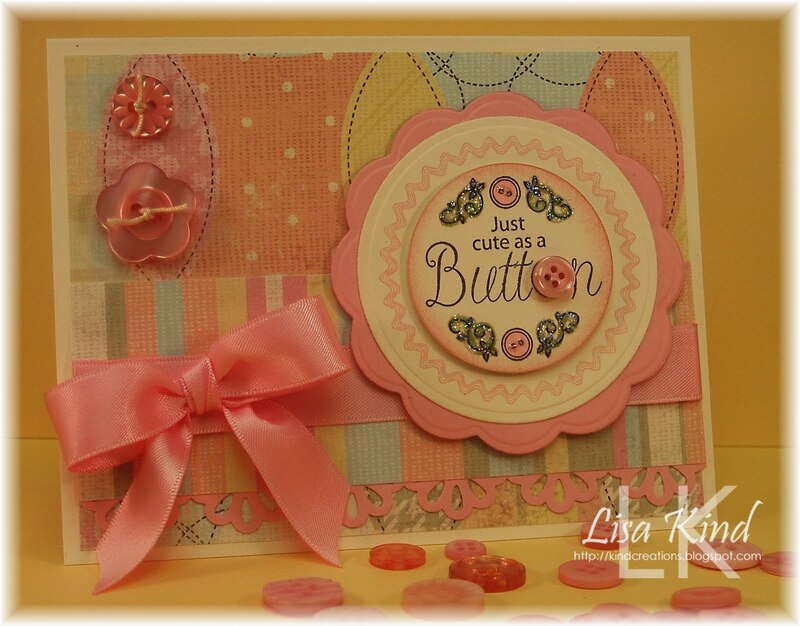 Today we are having a virtual baby shower for our fellow Paper Makeup Stamps DT member Lisa McKinney. She is due with her second baby, another boy, any day now. So because we couldn't all get together to have an actual baby shower, this hop will have to do! If you've come from the marvelous Maria's blog, you are on the right track. If not, head on over to the PMS blog and start there. For Lisa's card, I used one of the Paper Makeup Stamps baby Monster images that I just love. This is Baby Horatio. Isn't he so cute? I colored him with copic markers and swirled some apricot appeal ink around the background while it was still in the die. The dp is Animal Crackers by Making Memories. I added some blue ric-rac ribbon, buttons, star dust stickles, and a PTI sentiment. I hope Lisa has a speedy delivery and a very happy, healthy baby! Congratulations, Lisa! 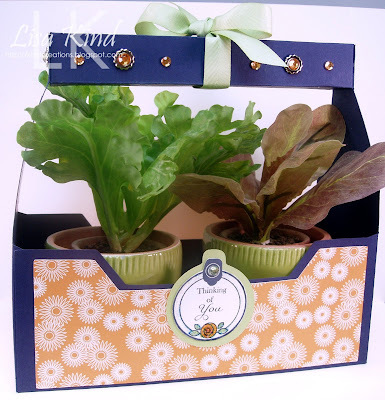 Now hop on over to Katie's blog to see what a great surprise she has for Lisa! Have a great weekend and thanks for stopping in! 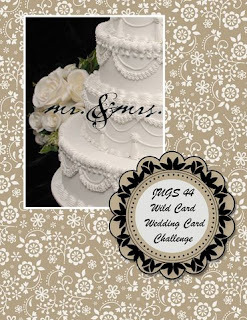 Today is a wild card challenge at Just Us Girls, and the challenge I chose was to make a wedding card. Deanna, the daughter of our fellow DT member, Pam, is getting married today so we decided to make this a wedding card challenge. Pam told me her daughter's colors were black and white with a splash of yellow, so I used those colors in my card. 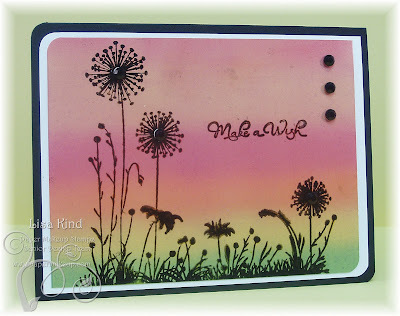 I used a new Cuttlebug embossing plus folder that cuts and embosses. It's called Lacy Door. I got it at my LSS, but you can see it here. The middle piece is cut out with the folder, but I put another piece of white behind it so I could stamp my sentiment (an old one from Hampton Art Stamps). That was mounted on black, then on the white base. I added the flower, silver jewelry piece, a pearl, and some leaves and was done! I like simple but elegant wedding cards. 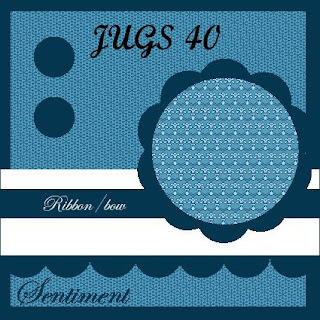 The JUGS DT girls have some really pretty wedding cards on the JUGS blog, so have a look. Please stop by their personal blogs and leave them some love as well. They love the company! You can find their addresses on my sidebar. I like the CAS challenges on SCS because I can get a card done quickly! The challenge today was: One Fish, Two Fish, Red Fish, Blue Fish. So I used Angie the Angelfish from Paper Makeup Stamps and an old CAS sketch to make this. I colored the image with various red and blue copic markers and added some star dust stickles to it. The dp is PTI's Bitty Dot Basics paired with brilliant blue. I think the ribbon is American Crafts. That's it! Cute and simple, but I'm not happy with the way my pictures have been coming out. The colors have been off and I'm no photographer! Happy Monday everyone! I can say that because I'm on summer vacation! Sorry to all of you that have to work today...I feel your pain! 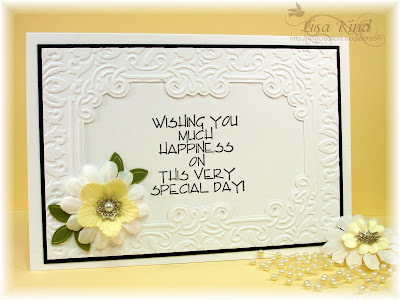 But I'm here to share a card I made last night for the Featured Stamper challenge on SCS. The FS yesterday was Toni (Ravengirl). She has a fab gallery and I chose this card to CASE. I kept the layout, but changed the colors and image (but kept it a tree). This cute tree image has a little story. My friends Cheryl Rowley and Tracy Harp each bought this stamp at our LSS one day when we were all there, and they had a little challenge to use it going on. I loved it so much I went back to buy it, but never used it! Go figure, huh? Well, when I saw the challenge today and Toni's card, I knew I had to use it! It's from Memory Box called Dotty Tree Birds. I stamped it in Memento espresso ink and colored it with copic markers. I added star dust stickles to the leaves. The dp is from October Afternoon called Fly a Kite: Ice Cream. I don't know where the flowers came from...I can't remember if I bought them or they were given to me, but they were on my table and they looked good on the card. The sentiment is from the So Sentimental set from My Time Made Easy. 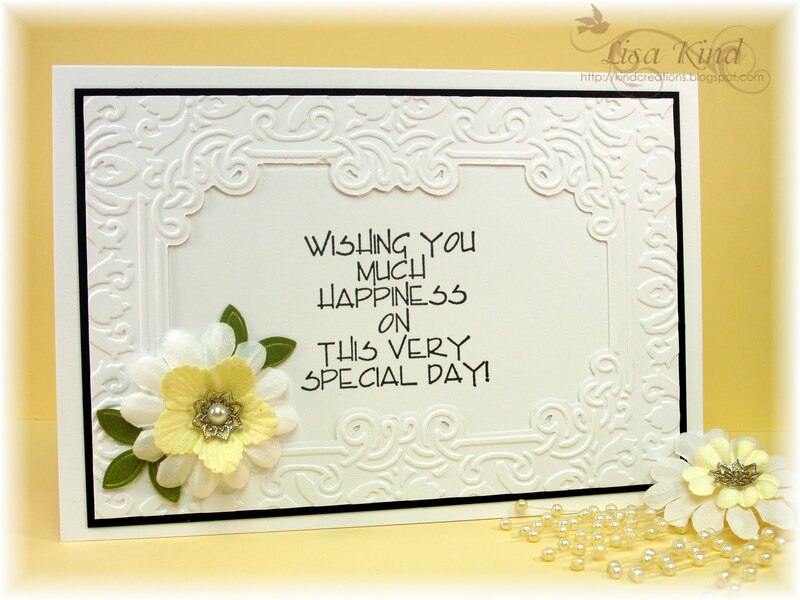 Love this cute little card that came together really quickly! Hope you like it too! Thanks for visiting today! Paper Makeup Stamps has come out with their second Makeup Kit (aka card kit). We had a good response to the first one called Celestial Possibilities and this month we have The Will to Day Dream. If you love the PMS fairies, you'll love the kits because the fairies included are only available in the kit. Here is what is in the July kit. When I saw the striped dp, it reminded me of a beach towel I had as a kid. So, I decided to have Will sitting on the beach on a towel looking up at the sky. I ran the brown dp through the mesh texture embossing folder to make it look like sand. I used an icicle punch for the fringe on the "towel". The buttons look like the sun and maybe some beach balls! Thanks for stopping by today! Hope to see you again soon! Hi everyone! I'm so happy to be participating in the Just Us Girls challenge this week with my team! I've been on vacation and was unable to participate with them for the past two challenges, and I'm thrilled to be using templates from Kelleigh Ratzlaff Designs for our template challenge this week! We are being sponsored by Kelleigh Ratzlaff, from The Digichick Shop. She has some wonderful templates to choose from. I had an idea when I saw her Sweet Strawberry template and the Easter Basket template. Here's what I did with them. I love strawberries! I think they are such a "pretty" fruit, so I was excited to create these...from paper! How fun! 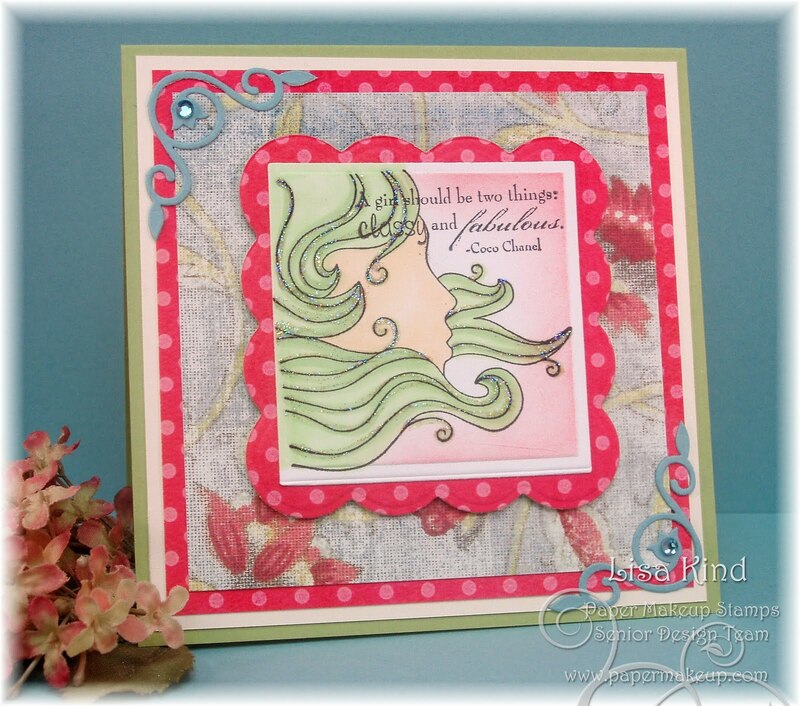 I used SU's retired Holiday Treasures dp for the berries and Bali Breeze dp for the leaves. I strung a piece of baker's twine from PTI for the stem. To make them shine, I spritzed them with Tsukineko Sheer Shimmer Spritz. 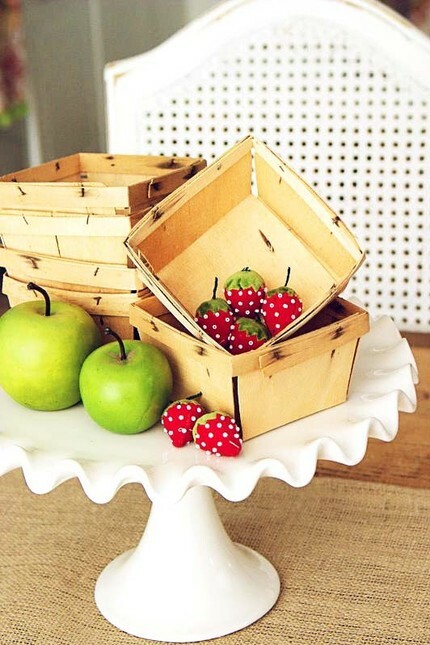 I was trying to figure out how to make the basket look like a real strawberry basket. I used this picture for my inspiration. I printed the template on PTI's vintage cream, then took PTI's chamomile ink and used the direct-to-paper technique to dirty it up a bit. Then I used Memento's espresso ink for the knots in the basket. I then added the strips around the top of the basket and stapled it like in the inspiration picture. I think it looks pretty much like it, don't you? Why not play along this week using a template of Kelleigh's or one of your own? You can find a free one from Kelleigh here that you can use. In addition to our weekly Chic of the Week contest, you could win a $10 shopping spree to Kelleigh's store. Stop by the JUGs blog and see what the girls have for you this week! Some fab stuff once again! Hi everyone! Are you a member of the SCS Fan Club? If so, the Dirty Girl challenges started on Saturday and I saw this one today from my friend Holly (Toy on SCS) and had to play! If you aren't a Fan Club member, join! SCS is full of so much inspiration it's worth the $25 or so a year to join! You can find the details of this challenge here (we are supposed to keep the details of the challenge secret to those non-members so they are enticed to become a Fan!). I love using the templates created by Lauren Meader (when she was designing for PTI and now for her own company, My Time Made Easy). This one is from MTME and it's called Trendy Tote! She makes them so easy to put together and has thought of every detail. I went super simple with this one! I started with the JUGs colors this week of orange, navy, green, and cream. I couldn't get something done in time to play with my team this week, so I decided to incorporate the colors into this project. I used SU's night of navy and certainly celery cardstock and Jersey Shore dp. I added the green and orange bling, the tag from MTME A Spot of Tea set, some star dust stickles on the tag, and certainly celery ribbon and was done! I cut the template out using my Cricut and SCAL program...done in a flash! Here's another shot of the side of the tote. My sister-in-law had surgery on her shoulder today, so I stamped the Thinking of You sentiment from the same MTME set. I'm going to fill it with some good chocolate and maybe a book or two. She's going to be laid up for about 6 weeks, so she needs something to keep her busy. Today I just filled it with some silk greenery in pots that I display on my kitchen window sill. Thanks again for stopping in today! I hope your week is going well! I'm off to straighten the house and finish my laundry before going out to a new restaurant tonight with my best friend, Maria! See you tomorrow! Wow! I finally stamped today! I checked out the SCS challenge for today and saw the Clean and Simple challenge was a sketch. I had an idea and it went exactly as planned...go figure! 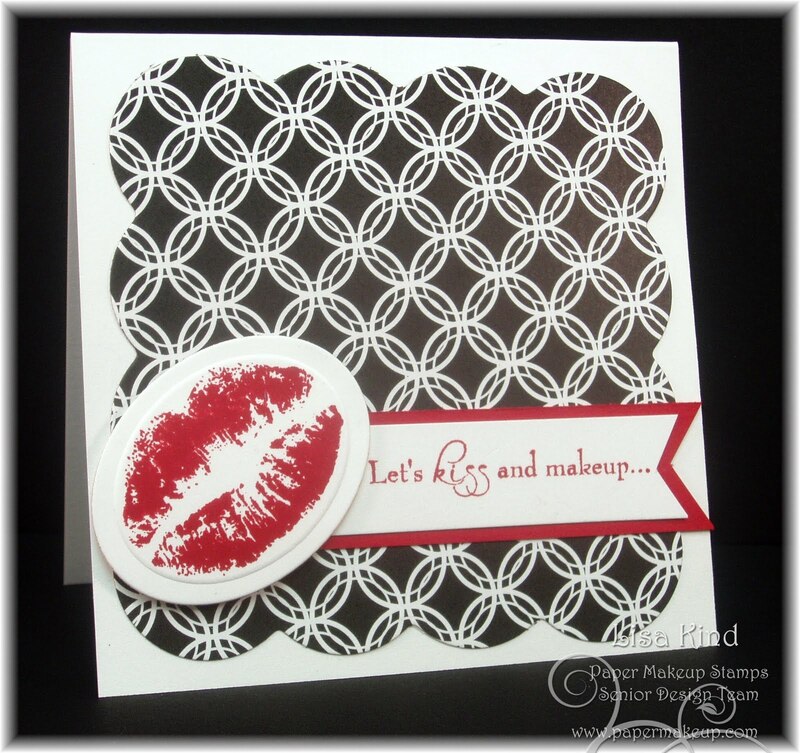 This is a new set from Paper Makeup Stamps called Kiss and Makeup. Aren't those lips fabulous? I wish mine looked like that! I used the big scallop square nestie to cut the Black and White Basics dp from PTI. The lips, sentiment, and cardstock are real red. That's it! I tried to add more, but restrained myself...it is a CAS afterall! 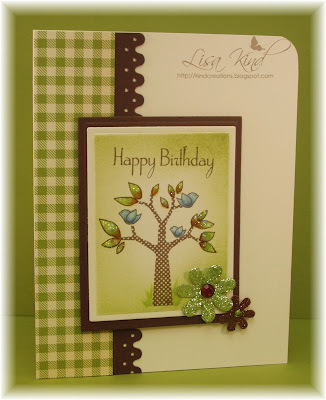 Love these cards...so easy and fast to create! Thanks for stopping in today! I hope to have more tomorrow! Congratulations Donna! I hope you enjoy the new Paper Makeup Stamps July release! I also want to thank all of you for the wonderful comments on my CTD post! I've never had so many comments before and it really felt good! I'm happy that you all enjoyed the card with the fab CTD colors (and new PMS image)! I hope my new followers will enjoy my future posts! Thanks for stopping by! Hi everyone! It looks like everyone is having fun commenting on my Paper Makeup Stamps and Color Throwdown blog post from Wednesday (here)! I've never had so many people making comments on my blog before! Such fun! Thanks so much for all the nice things you said about my card! I loved reading them! Remember you have until tomorrow at 11:59 pm to get your CTD card done and comment on the blog hop to win some fabulous prizes! (Check out the CTD blog info about this contest here.) I'm giving away the entire July Paper Makeup Stamps release on my blog, and Katie Cotton (PMS owner) has another prize give away going on...check out the PMS blog here for that information. Today, we are doing a review of the new set called Dandy Wishes. It's a set that you'll all want to have! It's a nice go to set when you don't want to color. Just stamp, embellish, and go! I sort of did that with this card. I started with SU's glossy cardstock, a rubber roller, and SU's retired Kaleidacolor ink in Pumpkin Patch. I just rolled the color on the paper and kept going over it so the colors blended in to each other. (When you first roll it on, you can see the separation of colors, so keep rolling until the separation of colors becomes muted.) I love how it sort of looks like a sunset with green grass on the bottom. I then stamped the image in Versafine black ink...big mistake! I used this ink because I like how nice and detailed the images stamp in it. But, it takes a long time for it to dry (even with using a heat tool!) 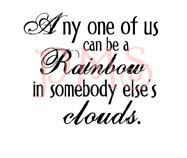 and you can smudge your design. Ask me how I know....can you see some smudges just above the sentiment? Ugghhh!! So use some other ink on the glossy cardstock (note to self!). 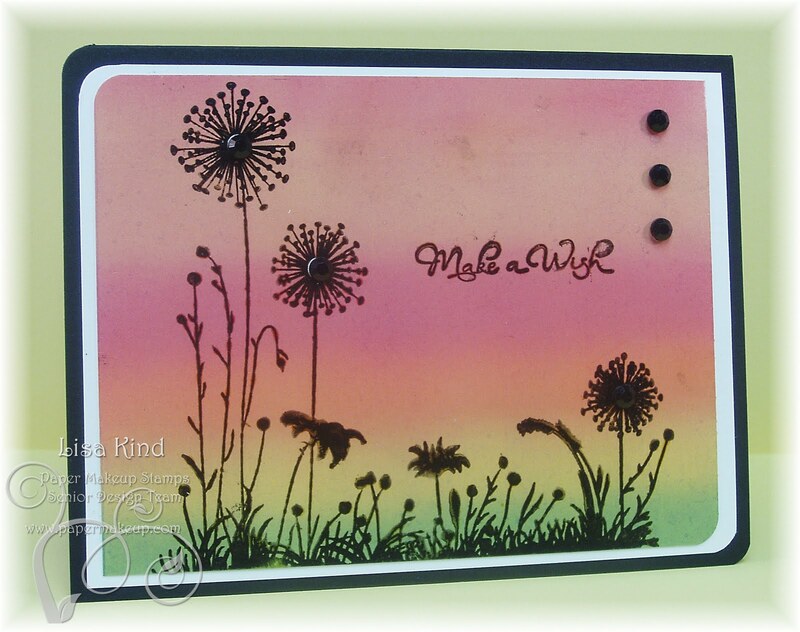 I stamped the sentiment (part of the set), added the black crystals to each dandelion and on the right side, rounded the two opposite corners, and I was done! I actually had to let it sit overnight, but it would have been done like that had I used a different ink! Stop by the PMS blog to see what the other girls have done with this set. I've seen one done by PMS DTer Lisa McKinney and it's so pretty! Very different from mine! I'm actually in Myrtle Beach right now with my girlfriends. One of my teacher friends has a condo there and was nice enough to let us rent it for the weekend. We are still celebrating my birthday (which was in April), but we always get away together once or twice a year for a girls' spa weekend. I have some really great girlfriends and we really enjoy each other's company and always have so much fun together! I hope you are enjoying your weekend! Thanks for stopping by! Just Us Girls Challenge and Happy Birthday Kathryn! If you are looking for my CTD post, please scroll down to the next post. Hi everyone! 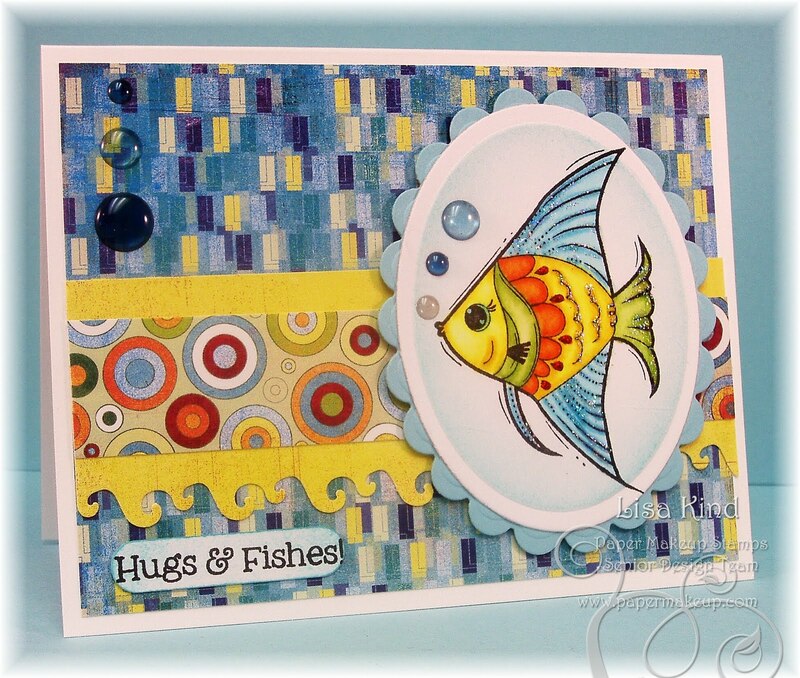 I'm away this weekend in Myrtle Beach and did not have a card ready for the Just Us Girls challenge, but you can see all the details and the fantastic cards the girls have made on the JUGs blog! 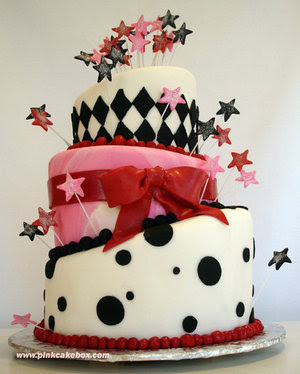 I did want to send out Happy Birthday greetings to my JUGs DT friend, Kathryn Berthiaume, whose birthday is on Monday! 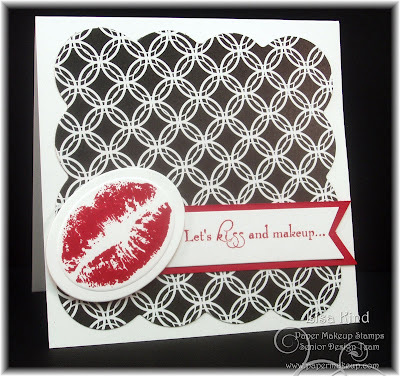 See you tomorrow for a Paper Makeup Stamps review day! Thanks for stopping in! Double Hopping with PMS and CTD! Hi everyone! Today is a PACKED post! It's a double hop with one card! 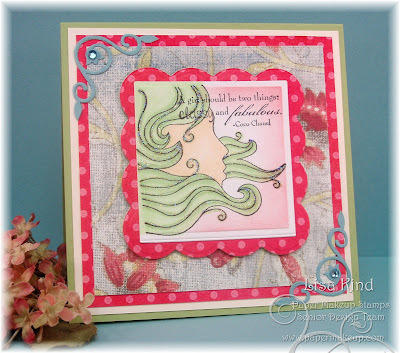 Secondly, it's the 100th color challenge at the Color Throwdown Challenge blog! Woohoo!!! Those girls are so talented, and always come up with some great color combos! I'm not on their team (that's just a dream of mine! ), but they've asked all of their previous guest designers to participate in this challenge. I was honored to be guest designer in October 2009, so that's why I'm hopping with them today! And there are some fabulous prizes being given away. You can get the details on the CTD blog, but in a nutshell...you have to comment on all the blogs participating in the challenge (one comment per person and I have them listed below) AND post a card using the colors on the CTD blog by Monday, July 12 at 11:59 p.m. in order to be in the running. Each participating blog is giving away some fab prize, and mine just happens to be the entire July release from Paper Makeup Stamps!!!! (I wonder how I got that prize to give away! LOL!!) One of you is going to be so lucky because this month's release is HUGE! Good luck! Now, here are the CTD colors to play with for this 100th celebration. I have to admit that this was a challenging one for me...I think I got it to work ok (but I think I've lost my mojo...it's still on holiday!). Here's my card. I first pulled out cardstock in the four colors, then pulled out every dp I had that could possibly work with this combo. After much consideration, I chose these which are both My Mind's Eye. The floral print is an old one called Wild Asparagus, and the other is from the Quite Contrary line. The image is a new single image called Beauty Profile. I just love that image. To keep with the colors, I had to color her hair green (I really like it! ), and swirled some regal rose ink around the white part. The sentiment, which is from a new mini set called Beautifully Fabulous, was stamped over the image as an after thought (and is a little crooked because of it!). It's a quote from Coco Chanel which reads "A girl should be two things: classy and fabulous!" Love that saying! The corner pieces are a cuttlebug die. I added the blue crystals to it and some star dust stickles to the image to bling it up! Here is a list of all the participants in the CTD hop. Please make sure you comment on them all for a chance to win! So now you have to hop! Remember my PMS letter for you is "A" and you should head over to Andrea's blog to see her amazing reveal! Thanks so much for double hopping with me today...have fun on your way! A Special Fairy Just for Me! I'm so excited about today's post...it's been a long time coming! Paper Makeup Stamps is in Day 3 of the July sneak peeks and today we are showing you the new fairies. Katie has several fairies named after her family and friends and some after the design team. She has tried several times to name a fairy after me that didn't quite work out. But we finally have one that even looks like me! Here is Lisa fairy. 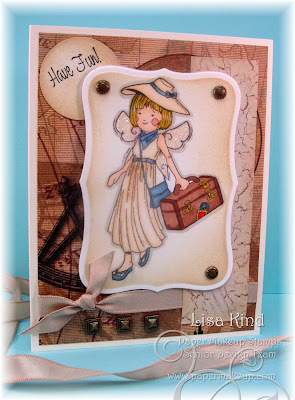 My hubby and I love to travel, so she had a traveling fairy designed for me! Cool huh? I guess she even gave Diem Pascarella (the artist) a picture of me! The sentiment is a free one with every order this month, too! The dp I chose is a very old one I've had forever. It's an old world map that, after cutting and placing the image on it, got sort of covered up! 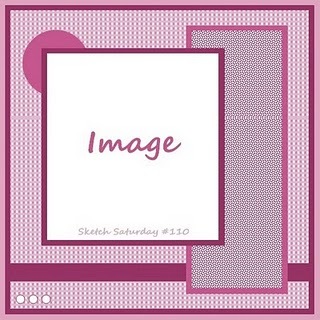 The sketch is from the Saturday Sketch blog (a new one to me). Stop by the PMS blog to see what the other DT members have done with the new fairies! Remember that the release day is Wednesday with a hop all day and the release party in the PMS forum at 8:00 CST pm. Hope to see you there! Thanks for stopping in today and have a great week! My JUGs post is below, so please scroll down! Hi everyone! 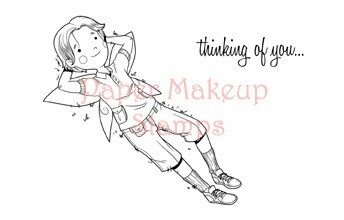 Today is the day the sneaks begin for the Paper Makeup Stamps July release! PMS has a new line of stamps called Retro Cutie Critters, and this month we have a sentiment set to go along with each of those critters as well as two new critters. I have a sentiment that goes along with Angie the Angelfish, which was released last month. 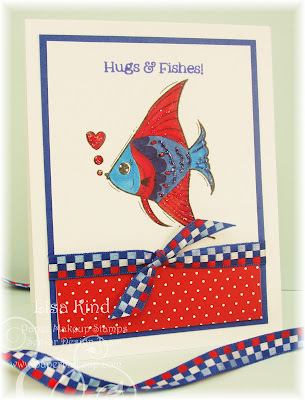 The sentiment "Hugs & Fishes" is one of seven in the set. Angie is colored with copic markers, and the colors came from the Basic Grey Lime Rickey dp. Angie has three bubbles coming from her mouth on the stamp (one of them a heart), but I chose to leave those off and use the blue bubbles instead. I put three more in the upper left corner. I used a wave border punch on the yellow piece to go along with the fish theme. I should mention that the sketch is from today's Just Us Girls challenge. Want to see more? Stop by the PMS blog to see what the other DT has done. We have sneaks all the way through the Release Day on Wednesday, July 7th. We'll have our hop that day and a release party in the evening at 8:00 pm CST in the PMS forum. Enjoy the sneaks. I'll be back on Monday with another sneak of an image that's very special to me, so please stop by again! Hi everyone! Today Just Us Girls has a fab sketch challenge for you and a FAB sponsor! First up, here's the sketch from our hostess Pam. Next, our sponsor this week is JustRite Stampers! The JUGs DT has used their stamps for our challenge today! I used a set called Stitched with Love. I fell in love with that set when I saw it! (I don't know what's going on with my camera lately...the pictures are coming out bad! Time for a new one, I guess!) I decided to make this a baby girl card since my cousin, who lives in California, just had a baby girl. This is off in the mail already! I stamped the image twice, punched out the center with I think a 2 3/4" punch then layered it onto the other piece with dimensionals. I colored it with green and pink copics. The dp is from Hobby Lobby and the ribbon is from SU. I used the Bow Easy to make my bow, and a Martha Stewart punch for the scalloped border. I added the buttons because, well....I had to because of the sentiment! Love how easily this went together! JustRite is a very generous sponsor! They are giving away some nice prizes! First, we will have a random winner for all participants. One person will win TWO brand new square Christmas sets with a square stamper and the new Idea Book! WOW! We also have another contest going on. 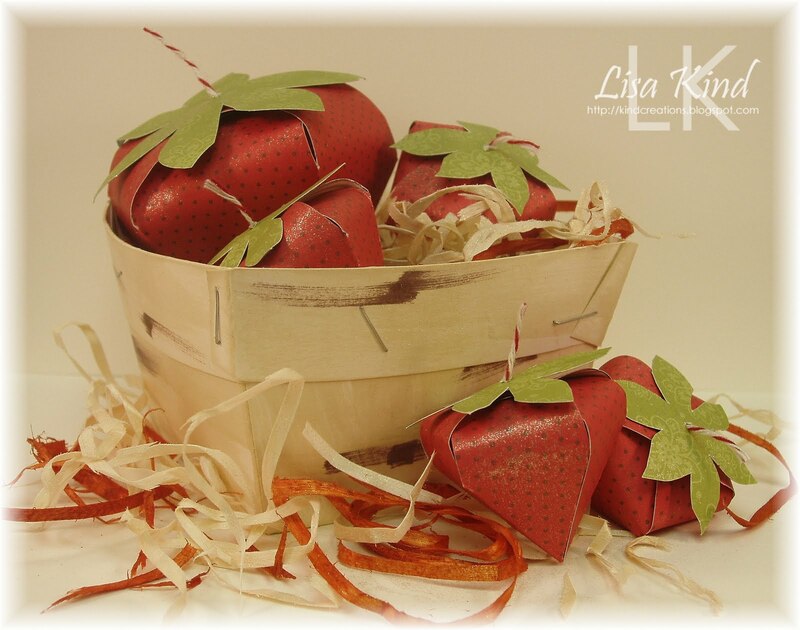 If you have JustRite stamps and use them for our challenge, you will be entered in a random drawing to win the Breath of Spring set and oval wood stamper! So you could possibly have 2 chances to win! Can't beat that! Stop by the JUGs blog to get more details and link up your card. The DT has some great inspiration for you too! Don't forget to stop by their personal blogs and leave some love! They'd really appreciate that! 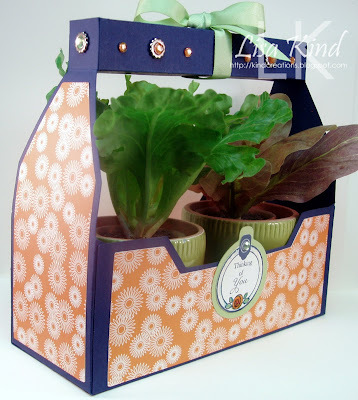 I'd also like to welcome Debbie Marcinkiewicz as our July featured designer. Welcome Debbie! Thanks for stopping in today. Enjoy your 4th of July holiday weekend if you are in the States!